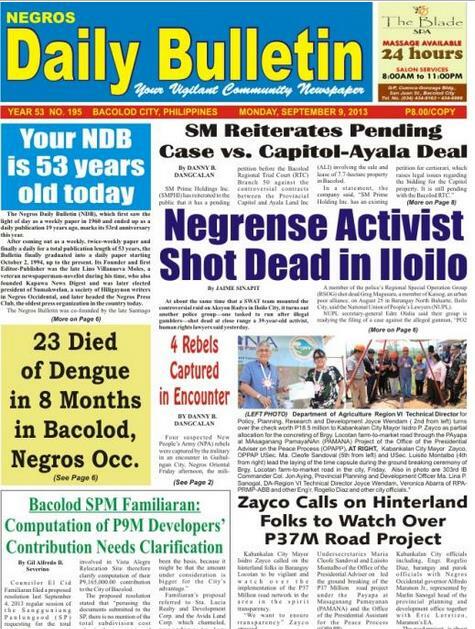 Negros Daily Bulletin (NDB) is celebrating her 53rd Anniversary, Monday, September 9 as the vigilant community newspaper in Region VI, Western Visayas, PH. I am indeed very happy for the success of NDB after surpassing the greatest challenge ever happened in newspaper business. I know that the people behind this humble community newspaper are true to their creed as writers and committed to the service of providing unbiased news, hard-hitting opinions, among others. It has been said that success cannot be won at any price, nor can it be measured by the number of trophies or medals that can be accumulated at a given time, but it can only be felt by one’s feeling of satisfaction and of achievement. It’s absolutely true. That’s how I feel in my 12 years of attachment to Negros Daily Bulletin. Out of that faithful and trying years, I have no doubt that success attained by NDB is “purely a labor of love, a product of sheer guts and desire to prevail against all odds.” More so it is the “independence of mind, pioneering spirit and perseverance of its founders (of NDB) on with no hidden agenda, except the desire to be of service” in information dissemination. As the NDB Ed, Pert Toga, puts it: “without relying on anyone or any vested interest, but on own hard work, sacrifices and sheer determination through the years.” I do uphold that assertion. It’s my honor to be one of those 12 first corporate officers when NDB got her legal corporate entity as Negros Bulletin Publication, Inc. on September 19, 1995. I was one of those who shared with the NDB’s success when it received the “Best Environmental Reporting” (daily category) as conferred by the Philippine Press Institute (PPI) and the Konrad Adenauer Foundation (KAF) of Germany in for 3 years (2000, 2001, and 2003). How I joined with the NDB was worth remembering. It was sometime in 1991 that I was tapped as a Negros Bulletin (weekly) news stringer in La Carlota City. Fred Brizuela, D’ Lifeblood columnist, and BIR Collection Agent of La Carlota, was instrumental in introducing me to Editor Pert Toga. But before that, I used to request Fred to submit my news to the paper on what’s the news and interesting happenings in La Carlota City. As a BIR man. Fred was always busy. So I had to submit my news articles personally. Every week then I had to commute to Bacolod to get my write-ups in print. In one occasion, I got interested with writing a column upon seeing Leo Claridad’s From a Distance. I talked to Sir Pert how Leo became an instant columnist. 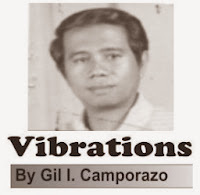 Without so much ado, he just simply urged me to write a column and I started it with Random Vibrations, which later came out in print as Vibrations, which as of this writing I am maintaining it. Thru thick and thin, I survived the tests of time as a part time columnist of the said paper. I am now a virtual member of Negros DailyBulletin family. I am a living testimony on how Negros Bulletin grew from bi-weekly, tri-weekly and now a daily newspaper. In that 12 years of community journalism and acquaintance with the staff and personnel of NDB, I value the companionship, camaraderie of the late veteran-columnists Monet Padilla (Bull’s Horn), Gene Flora (Bulletin Board), Porfirio Lopez, blind columnist (Treat ‘em Right), and also the late vernacular writers Ric Sumagaysay and Octavio. I am grateful with the warm friendship of Rolly Espina (The Observer), Armand Toga (Freelancer), the fellowship of Nestor Padesio (NDBs Sports Editor), and the understanding and tutelage of Pert Toga (Bulletin Ticklers). To be a journalist has a good and bad effect. I remember when I wrote about the conviction of a prominent family in La Carlota City, who was convicted by the court of illegal possession of prohibited drugs, I was then virtually ostracized by my college mentor because of that press release I made about his brother. However, on the other hand, I fell complete and satisfied when I wrote without reservation the conviction of my teenage nephew and his bosom friend of illegal possession of prohibited marijuana grass. The court meted them life imprisonment. It was a headline in the NDB. But the innocence is always exonerated. After serving their term for 2 years in Muntilupa jail, they filed thru a lawyer a review of their case in the Supreme Court. The high tribunal reversed the decision made by the lower court and they’re acquitted. It’s God’s will I know. My connection with this prestigious vigilant newspaper as a community writer, I have reaped success in my job. I have written various articles on community, education, government, and health, that has helped me a lot on my job promotion from classroom teacher to head teacher, and head teacher to full-pledged school principal 1 for a span of 15 years in the education field, for that time I changed employment from private to government. Actually before I was connected with the government, I was an employee of the defunct Rural Bank of La Carlota, Inc. for 5 years (1975 – 1980). In this period , in a certain social gathering, I met Edmundo Aspero, news anchorman of dyHB, Radio Mindanao Network before. We became fast friend and he introduced me to the late Nat Sitjhar, RMN News Director who assigned me in La Carlota as stringer. Thru the effort of the late RMN Manager Ramon de la Luna, I took the KBP accreditation examination for newscaster and I passed. When I became member of The Church of Jesus Christ of Latter-day Saints in 1980 to 1991, I hungered for news reporting. Later in 1991, I made a comeback in news reporting when Fred Brizuela introduced me to NDBs Editor Pert Toga. And that’s why until now I’m still vibrating. Yes, whatever matters I’m still vibrating in Negros Daily Bulletin, for I know God has something for me to do, be it social, emotional, psychological, or spiritual! Congratulations NDB in your 53rd anniversary! Long live Negros Daily Bulletin! I really have high regard for columnist especially for a local paper as you can influence people and at the same time touch their life. 12 years is really an impressive feat. Wow, I am so impressed at your track record in writing, Sir! You are dong such a great job and congrats to your local paper! wow! it is really an honour to be a part of a news team or any publication. and it's a nice pic there which goes with your byline I assume. More Power to NDB. They are lucky you've been a part of their team and 'still vibrating'! All I can say Sir is that, all the hard works each and every officers as well as ordinary member of this newspaper are now translated to tangible matters. For you sir, I know being part of this organization has honed your writing skill to a higher level. Being a journalist was my first choice of a career being involved in our school paper back then but I took up Accountancy and ended up successful with it. 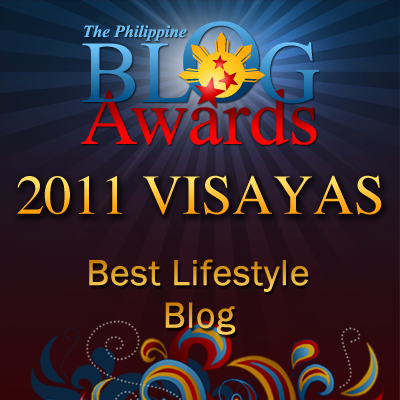 This is the reason why I love to blog now, because writing was always my first love. Nice to know that you're also a columnist. It is such a great job while helping others as well. It is great to know that this kind of print is still around considering the advent of technology. OTOH, it was a dream of mine to one day write something in this kind of print but not to become a columnist though. Congratulations! I truly miss writing for real - in the paper. :) Keep up the good job! Oh wow, you have been writing for so long. It really is nice to hear positive stories like this to encourage would-be writers of today. Wow! I didn't know na naging journalist ka rin pala :) Happy anniversary sa NDB. Saludo po ako sa inyo! Writing is your passion talaga. Congratulations! To you Sir Gil and to NDB. I believe you are one of the asset in the NDB and I salute you for the great work. Congratulations. You truly deserved it. Keep it up. Congratulations to you and Happy Anniversary to NDB!